Looking for hotels in Sairee Beach? Located in Koh Tao, Thalassa offers cozy rooms with air conditioning and the convenience of a 24-hour front desk. Free Wi-Fi is available throughout the property. Great location right in the middle of town but room still very quiet. Comfortable bed and clean room. Cable channels on TV. Air con. Ticks all the boxes. Close to lots of dive shops! The Sky Hometel is located on the beachfront in Ko Tao, 1.1 miles from Nangyuan Island. Featuring an ATM, this property also welcomes guests with a restaurant and a terrace. Bed comfortable and small kitchen outside the room. Staff nice and helpful. Sai also helped me with an issue not related to the hotel! Thanks again! A 5-minute walk from Sairee Beach, Sairee Seaview Hotel Koh Tao offers simply furnished accommodations with private bathrooms. Free Wi-Fi is available in the entire residence. Staff were very friendly, rooms were clean and maintained. Great location and amazing views at such an affordable price. Asia Resort offers a range of no-frills and Thai-style rooms, within tropical landscapes. Featuring an on-site PADI diving center, it has free Wi-Fi in public areas, a spa and outdoor pool. Close proximity to everything, yet far enough away from all the night noise. Helpful staff and clean spacious rooms. Stayed 4 nights. I would stay here again. C. J. Kitchen down the street on the right is a great asset to the neighborhood. This Lady here is a wonderful cook. She washed, dried and folded our clothes. Rented us scooters, provided her husband as a taxi to pier. Had the coldest, reasonably priced beer in town. All for very reasonable prices. Tell her the 2 old guys from California sent you! 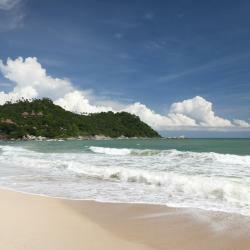 Featuring a terrace, Blue Tao Beach Hotel is located in Ko Tao, 1.1 miles from Nangyuan Island.